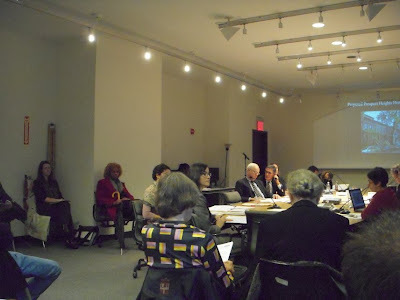 The Landmarks Preservation Commission had a busy day yesterday, drawing large crowds on two matters where community sentiment is clear. 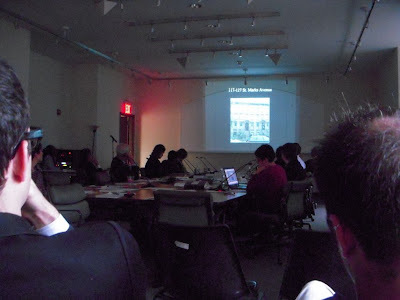 In the morning the Commission moved uptown to the Lang Student Center at the New School to consider the Rudin/St. 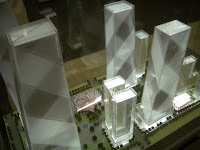 Vincent’s real estate development proposals. This bigger venue filled up so the attending public’s groans and sighs resonated loudly. The public reacted with disappointment to each of six commissioners' votes to allow the destruction of the landmarked O’Toole building in order to subsidize St. Vincent’s Hospital. There was firmly supportive public applause for each of the four commissioners who voted against O’Toole’s destruction. There is much more to say about this, which we will post later. In the afternoon the Commission took testimony about the proposed Prospect Heights Historic District. The crowd was large. 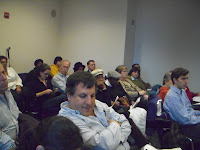 It was universally in favor of the district’s creation, unless you want to take into account a woman who did not know that this wasn’t the forum to ask about the location of a fire hydrant, or a district creation supporter who wondered if there could be some sort of exemption at street level for Flatbush storefronts. The Atlantic Yards megadevelopment abutting the proposed district was mentioned countless times. It was cited repeatedly as the threat which makes creation of a historic district so important. People such as Atlantic Yards opponent City Council Member Tish James were careful to refer to the “proposed” Atlantic Yards. She lingered on the word “proposed” in a deliciously savoring way. We provided our own Noticing New York testimony. We were one of the few who, when we testified, did not feel that we had to speak within the framework of simply being thankful for what was offered. The district is being created by the hard work and pleading of community representatives. Noticing New York is independent and has not directly taken part in those negotiations. 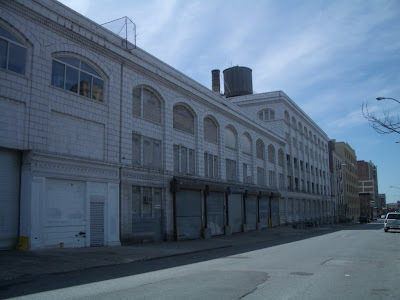 As we have written about before, the Landmarks Preservation Commission is very responsible for the cataclysmic trajectory of Atlantic Yards through its avoidance of action with respect to historic buildings like the Ward Bakery Building. Whatever some might want to pretend, we do not believe that Atlantic Yards should be treated as political past tense. The Atlantic Yards project is neither dead nor alive, and it is insufficiently apologized for by the Bloomberg administration. The project cannot survive without the continued complicity of the administration and all sorts of necessary public approvals still hang in the balance. We believe that the administration and those working with it need to be constantly reminded of the political price they pay for Atlantic Yards until the project is formally, once and for all, dead. It is no secret that the Prospect Heights district is a case of “historic district creation by guilt.” (We’ll be coy, so we won’t suggest that this a description of the process that is floating freely among Landmarks staff.) 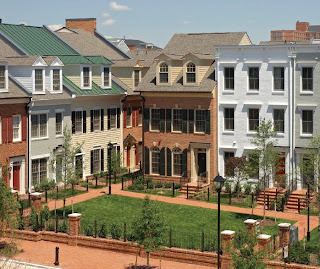 Creation of a historic district by guilt is not adequate compensation to the community. This unparalleled activity has been made possible through close collaboration with the public and the preservation community. The number of buildings the LPC has designated is not the point. When it comes to being “outflanked by developers,” it is not what the Commission does, but what the Commission doesn’t do; not what the Commission protects, but what the Commission, serving the Mayor’s willingness to accommodate fellow billionaire real estate developers, does not protect. In our article, we were (we think correctly) more flattering to the Commission activities that the Times: “the Commission is highly capable and does do its job excellently when permitted by the Mayor.” Still, since the Commission is so capable it is all the more frustrating when it refrains from being so. Protection is not protection if it is Swiss cheese especially to those who would abuse their power. Protection which is a bulwark only when threat is not present is not protection. Clearly, if the Commission had worked in “close collaboration with the public and the preservation community” as Chairman Tierney described above, the Ward Bakery Building would have been saved for adaptive reuse. No doubt the Greenwich Village Historic District community, which is now threatened by the Rudin/St. Vincent’s real estate development, feels the same way. The importance of allowing our precious historic Brooklyn to weave together is the reason why the hole in the proposed historic district is so disconcerting. It will separate historic Prospect Heights from historic Fort Greene. We know that the odd shape of the proposed Historic District is disingenuously intended to accommodate the similarly unjustifiably odd shape for the proposed no-bid Atlantic Yards project. The Boymelgreen wrench shape of the Atlantic Yards project is notoriously odd, shaped exclusively for the purpose of generating windfall eminent domain and upzoning profit for Forest City Ratner. 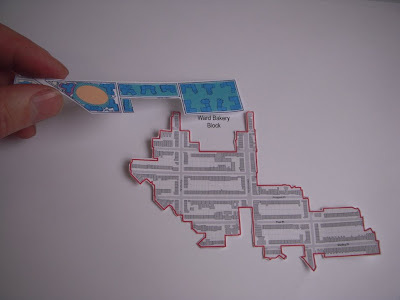 Looking at these two jigsaw pieces it is easy to put the puzzle together. In our testimony we were conscious that while the way in which our historic neighborhoods weave together is extremely important, this might be considered tangential to historic preservation concerns. Thankfully, the presentation of LPC’s own presenter also focused on the way that these neighborhoods had historically developed, each weaving into the other. Patti Hagan also testified about the loss of the Ward Bakery Building, noting that she had passed by the site of demolition. She spoke of the irony that the building’s 100th anniversary should coincide with Forest City Ratner’s destruction of it. 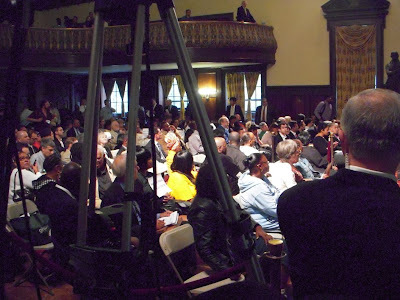 As usual, Atlantic Yards Report also provides its unusually good coverage of the hearing: Wednesday, October 29, 2008, At LPC hearing on Prospect Heights Historic District, mention of the Ward Bakery and AY briefly unsettles the mood. Here is our full Noticing New York testimony. This comment is being offered in the name of Noticing New York, an independent entity dedicated to the proposition that developing New York and appreciating New York go hand in hand and I speak as an attorney and urban planner experienced in real estate and government. There is a well known axiom about real estate that “they are not making it anymore.” This isn’t true. We are making more real estate these days. In fact, it is easy to make a lot more of the tall stacks of apartments that allow for anonymous and nondescript high-rise living. What we are not building anymore are neighborhoods like Brooklyn Heights, Cobble Hill, Carroll Gardens, Park Slope, Fort Greene and historic Prospect Heights. If you are wealthy you can afford to pay top dollar to live in Brooklyn Heights, where property values have been rising phenomenally. But you can have a very similar urban experience much more affordably in diverse, historic Prospect Heights. I am, perhaps, inaccurate. We are building places like Park Slope and Prospect Heights. 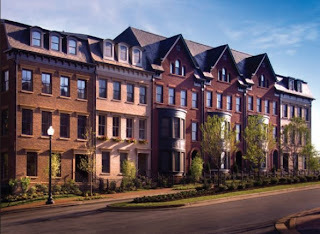 I refer you to projects of “New York-style brownstones” being built in Alexandria, Virginia and Potomac, Maryland by Builder/Developer EAY (see attachment). Looking at this New York recreation you know that others, elsewhere, are valuing what we have in Brooklyn, New York. But building a new Disney-fied version of what we have does not truly build more of what we value. It doesn’t have the true history, and it doesn’t organically weave together the way that the brownstone neighborhoods of Brooklyn do. We ask you to proclaim this commission’s independence from the Mayor. Say no to corrupt no-bid projects and save the historic part of Brooklyn that should be allowed to weave naturally together in a healthy urban fabric. The editorial page of the New York Times recently called for this commission to have the political will needed not to be outflanked by developers. We added our own thoughts to those of the Times with our article, attached hereto, calling for your greater independence to pursue this same goal. We would like to think that Noticing New York is doing a pretty good job in observing and commenting upon the way that the public environment in New York is being built and managed. We hope that we are living up to the standard we set, dedicating ourselves to the proposition that “developing New York and appreciating New York go hand in hand.” It has come to our attention, however, that if Noticing New York ever falls down on the job, there is a cadre of budding young journalists ready to step in to pick up the slack. Noticing New York has also commented on the Bloomberg-led funding of the Waterfalls; an involved and artfully complicated performance in itself: Wednesday, October 15, 2008, Self-Congratulation “Befalls” a Man Who Would Know No Limits. If Noticing New York Falls Down on the Journalistic Job. . . It turns out that five essayists from Saint Ann’s, the Brooklyn Heights school, have also provided excellent commentary on the Waterfalls in the “Saint Ann’s Ram” (October 17, 2008, Vol. XII No. 1). If you are interested in urban planning issues and New York governance, the Ram gets into some pretty meaty stuff. 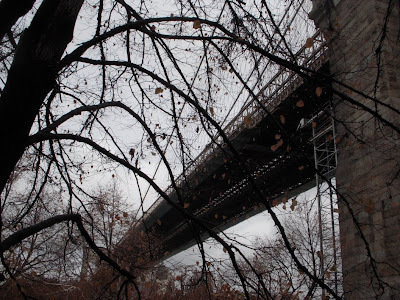 In the same issue Susan Yassky reflects on the development of Brooklyn Bridge Park interviewing Marianna Koval, the president of the Brooklyn Bridge park Conservancy. (Eliot Spitzer’s scandalous downfall was dealt with in point/counterpoint fashion by Maggie Henry and Grace Dunham.) We are tempted to get into a discussion of the Koval/Yassky interview postulation that it might be “wishful thinking” to believe that parks don’t necessarily have to be “self-sustaining,” instead of, for instance, taking into consideration increased property tax receipts as community property values rise. We will we have to save that discussion for another time. I’d like to think that younger journalists might bring a fresher, less jaundiced eye when reflecting upon the value of the Waterfalls, one that might be more spontaneous and less influenced by having learned what we are supposed to think about public art. In our view the five journalist-essayists reviewing the Waterfalls, (Michael Danziger, Julia Greenwald, Emma O'Connor, Ilana Harris-Babou, Mina Seckin), were sterner critics of the art installation than we ourselves were. Since the Saint Ann’s school is in Brooklyn Heights, these commentators were in a neighborhood that probably had the best possible vantage point to consider all four waterfalls. The word associated with the predominate theme of the reviews, which came up in a number of ways, was “waste”: “waste of energy,” “waste of time,” “utter waste of energy and water,” “waste of time and money.” Only one of the reviews, Mr. Danziger’s, did not specifically invoke the “waste” word, but the theme was sufficiently present when he called the Waterfalls “moronic” and found himself asking "why do these exist?" He didn’t seem to find a satisfactory answer. The reviewers also found themselves tending to regard the Waterfalls as something that was pitched to tourists, exuding an overly-commercial feel. Mr. Danzinger disparages the tourism revenues and associated gawking. Ms. O'Connor considers tourists’ expenditures on Waterfall packages a waste and is skeptical of the estimated $55 million in boosted city revenues that were supposed to result. Ms. Harris-Babou finds Waterfalls “too commercial,” mentioning “Greyhound bus tour guides” and says she experiences the “hype” surrounding the Waterfalls as a detracting element. She links in the officiously demanding signs in the state-run (Empire State Development Corporation) Brooklyn Bridge Park viewing area. The signs say: "TALK", "PLAY" and "WALK," she says to “remind park-goers that he or she is being entertained” and she reports on how it summons up for one viewer the feeling of “an ad for Ikea." Ms. Harris-Babou sees the commercialism as “a sorrowful glimpse into the future of Brooklyn waterfront development.” Ms. Seckin actually zeros in to interview tourists whom she found unreceptive to the Waterfalls unless she “gave them background information on Eliasson's perspective of his art.” In some cases she found them unappreciative even afterward. One tourist whom I asked said that the waterfalls not only made the Brooklyn Bridge look like it was taking a massive piss, but that they made her want to take a massive piss as well. The reviews tend to see the see the Waterfalls as an unspectacular effort. Two of them unflatteringly compare them to waterparks. They are half-hearted attempts that belong in a waterpark, where they would not only blend in with the setting, but would also be put to better use. Unfortunately, Waterfalls are plant killing, nondescript excuses for art that creepily resemble a water park ride from the 1980s that was sued for killing too many children. After talking to many people, I have come to the conclusion that nobody really cares about the Waterfalls.
. . . generally people are relatively indifferent. I guess you have to be---how much can you really say about a bunch of bars, pipes, and water that you cannot get closer to than 2000 feet without wasting $25 and an hour of your time? Some people have described them as "a construction malfunction," . . . I now wish that they were only run at night. Not only would it require less energy, but more importantly, we would see only the impressive aspect of the Waterfalls, and not the scaffolding which adorns almost any block in New York City. This reminds us what any clever real estate executive knows about promoting real estate projects. Lighting, presentation, and pretty pictures help. In real estate promotions, skies are always blue, trees (perhaps actually non-existent) are leafed out, and the ideal time of the day is often that evening hour around sunset when a building’s interior lighting is just beginning to interplay with the soft glow of the sky. . . . . feel out of place. If juxtaposing them. with actual waterfalls, they are an affirmation of man's subordination to nature; compare the metal scaffold and conveyor belt to, say, Niagara Falls.- Man created one, the other formed naturally; water naturally flows over Niagara falls, pumps and conveyor belts are required to shoot water out of the Waterfalls. Funded by private donations raised by the Public Art Fund, this approximately $15 million display is being hailed as the biggest outdoor art project in New York since The Gates in Central Park. However, a thick cloud of controversy hangs over this bold statement of public art. In asserting that the project is “funded by private donations raised by the Public Art Fund,” Ms. Seckin doesn’t report the lead role Mayor Michael R. Bloomberg took in channeling money into the project in multiple ways and the fact that $2 million in federal funds, certainly not private money, was steered into the project by the Lower Manhattan Development Corporation. Mr. Bloomberg controls half the LMDC board, and the LMDC was set up to help with the short-funded ground zero redevelopment effort and lower Manhattan recovery. It received federal block grant funds (like the block grant funds used for the Waterfalls) for “disaster recovery” purposes. In addition, what was counted as “private money” included money from a City Hall-based charity that Mr. Bloomberg controls as Mayor. Although the young writers picked up on the whiff of ego hanging in the air over the Waterfalls, they did not seem aware of Mr. Bloomberg’s presence, despite the many hats Mr. Bloomberg has been wearing to bring the Waterfalls to fruition, including privately lead-sponsoring the project with Bloomberg, LP media company funds. When Ms. O'Connor unwittingly said that the artist himself had (in a perhaps self-inflating fashion) predicted a $55 million tourism benefit from the project, she was therefore actually half-right. It was really the sponsoring Mr. Bloomberg who, doubly involved, made this projection through a city-controlled agency. The same Mr. Bloomberg then similarly gave his sponsored project a city award for its contributions to the public environment. Overall, the assessment of the young Saint Ann’s journalists were extremely valuable and on the right track. Their skepticism about the “art” was even stronger than mine. Paying attention to this skepticism expressed by these young citizens is important and encouraging as we look to the future. This is a follow-up to our recent piece assessing whether there was truth to the Bloombergian argument that the financial crisis makes it important that he remain in office (Thursday, October 23, 2008, Bloomberg Qualified Financial Crisis Leader? He Can Learn Says Schumer!). On October 16, 2008 The Wall Street Journal ran an opinion piece, New York Will Survive Without Bloomberg: The mayor never bothered to prepare the city for any lean years, by Jason L. Riley, a member of The Wall Street Journal's editorial board. Mr. Riley marshaled numbers to make a cogent case that, based on his record, Mr. Bloomberg shows no special acumen to lead the city through the financial crisis. Mr. Riley’s analysis of the numbers are in sync with our own thoughts about Bloomberg’s unsuitability to lead in this regard. We can also offer additional observations about other budget management concerns Mr. Riley did not talk about. We previously observed that as an insider Mr. Bloomberg’s likely lack of perspective is a threat to understanding or navigating through the Wall Street meltdown and its budgetary aftermath. We noted Mr. Bloomberg’s failure to see the crisis ahead of time and what looks like an infatuation with Wall Street preoccupations that may well explain it. Between 2000 and 2007, New York's tax receipts grew by 41% after inflation. "That's something that's never happened or come close to happening in the city's modern history," says Nicole Gelinas, who follows municipal finance at the Manhattan Institute. This windfall had everything to do with the Wall Street bull market, . . .
Let’s for a moment consider Mr. Bloomberg’s popularity. There is a self-flattering school of political thought that says that politicians rise and fall based on political ideas and movements. This may be partly true, but deflating the importance of the great-ideas and great-men theories of history is the observable lockstep relationship between economics and the election of presidents. How the public perceives economic conditions is apparently quite important. For an interesting read on this (extracts set forth below) go back to 2003: Economy & Business; With Change in Consumer Confidence, So Goes the Presidency, by Daniel Akst, December 1, 2003. Although economists may debate the extent to which presidents influence the economy, there is no doubt that the economy influences presidential elections.
. . . what counts more than the economy is how people feel about the economy, when they feel it and how optimistic they are. The Conference Board, a business research group, started conducting regular surveys of consumer confidence in the late 1960's, and since then, the data are clear: when the board's Consumer Confidence Index in the September before a presidential election is at 100 or above, the incumbent party wins the popular vote. It seems that the level of consumer optimism at midterm correlates strongly with the outcome of the next presidential race. ''When consumers feel more optimistic about the future than the present, the incumbent tends to stay in office,'' said Lynn Franco, director of the Conference Board's Consumer Research Center. We suggest that as with the chief executive of United States, so with the Mayor of New York. Though we have also suggested that most of Mr. Bloomberg’s mistakes are long-term mistakes that will take time to come home to roost (Coming to Terms With Mistakes, Wednesday, October 1, 2008), the economy during his tenure was good until now. A good economy may be perceived as even better than it is if, during that time of plenty, surpluses are lavished on services rather than set aside for harder times. Unfortunately, the political reward in saving for a rainy day may be meager. Whatever has been asserted about Bloomberg saving certain funds for a rainy day, Riley makes the case that he essentially did the opposite. . . .and everyone knew that the rate of growth was unsustainable. Instead of using the flush-year surpluses to put New York's fiscal house in order, however, Mr. Bloomberg mostly squandered them. His handling of the city's debt is particularly disappointing, if not irresponsible, since debt-service payments are legal obligations that can't be suspended during economic slowdowns. Since 1990, debt per person in New York is up by 185%, exceeding inflation by 118 percentage points and exceeding tax revenue growth by 27 percentage points. By most measures, New York has higher per-capita debt (about $7,000) than any other city in the nation. And while the problem obviously predates the current mayor, the future burden has worsened substantially on his watch. Instead of cutting other parts of the budget and using the city's swollen coffers to service debt and pay for capital projects out of operating spending, Mr. Bloomberg chose to increase borrowing. Between 2000 and 2007, debt grew by 5.7% annually and will continue to grow by 5.9% annually over the next four years. By increasing the city's debt obligations while doing nothing to decrease the city's overdependence on income tax revenue from Wall Street wages and bonuses, Mr. Bloomberg has exacerbated a bad situation. In thinking about Mr. Bloomberg’s Wall Street borrowing that exacerbated the city’s debt burden, we can’t help but remember that his business is selling services like his Bloomberg financial terminals ($1,500 to $1,800 per terminal per month as of 2005) to those same Wall Street denizens. Many firms times many terminals. Too cozy. Mr. Riley also takes Bloomberg to task for spending that far outpaced inflation (presumably spending funded by the aforementioned debt). Between 1975, when New York faced its last fiscal crisis, and the Giuliani era, city spending rose by just 9% after adjusting for inflation and population growth. Mr. Bloomberg's 2008 budget is nearly 50% larger than the one he inherited from Mr. Giuliani in 2001. 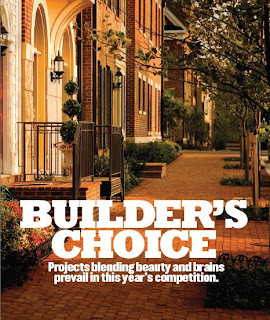 Cons in the “Pro” of Real Estate Development: Perfect Budgetary Storm? The mayor also deserves praise for his aggressive pro-development policies, such as rezoning large swaths of the city where industry is not coming back. In actuality, this may not be entirely good news. Mr. Bloomberg’s real estate development policies may represent another form of squanderous borrowing. We don’t want to sidetrack into the question of whether so much land associated with the industrial sector of the city’s economy should have been decommissioned. Certainly it was important to make a shift, but it is important to do these things intelligently and not reflexively. The elimination of a sorely needed graving dock (dry dock) in Red Hook to create an IKEA parking lot was a mistake. It eliminated high-paying jobs while replacing them with a similar number of much lower-paying jobs. If it was essential to have IKEA (with its parking lot), we could have had both IKEA and the graving dock. The city is now looking at spending a billion dollars to replace the sacrificed dry dock. (See: Brownstowner’s June 23, 2008, IKEA Dock Destruction: 'Billion-Dollar Boondoggle'? And the New York Post’s IKEA Berth Pangs, City Dock Deal a $1b Blunder, by Rich Calder, June 23, 2008) This reflexively silly sacrificing of assets is, of course, a concern, but it is not our foremost concern in terms of the approaching budgetary perfect storm. Like the Wall Street bubble, the NYC real estate bubble has temporarily benefitted the economy. The trouble is that we have been collecting the financial budgetary benefits up-front. The real estate transactions have generated huge up-front revenues in the form of things like mortgage recording taxes, real estate transfer fees, and salaries and “points” paid to the multiple transaction professionals and participants. Through programs like 421-a we are going to have created all at the same time the influx of a huge amount of new real estate which, by virtue of real estate tax abatements and exemptions, will be off the tax rolls for an extended period. Because of the extension of the 421-a deadline to December 31, 2007 a new crop are just now coming on line. The buildings are being built now, but we have not yet experienced the increased demand for services they will generate. This is another kind of borrowing against the future that Jason Riley did not identify. There should have been an assessment as to whether this kind of borrowing against the future made sense. If it was once assessed to make sense, the Wall Street meltdown could retrospectively change how that assessment balances out. So, Mr. Riley was probably too kind to Mr. Bloomberg, not taking into account these other things Riley probably did not consider. Third Term Likelihood Under New Political Label? Mr. Riley suggests that because of his approval ratings Mr. Bloomberg “is almost certain to win a third term” upon running again. We are not so sure. We think that there is plenty of time for the shift in the economy and a further examination of Mr. Bloomberg’s record to significantly affect his popularity. However, Mr. Bloomberg rechristened himself “an Independent” in June of 2007. (He has now been a Democrat, an Independent and a George W. Bush-supporting Republican.) That change is likely to have tactical value. It could likely mean that he will be challenged next election by a candidate on each of the major parties’ lines. Defeating an incumbent is always difficult, but defeating a well-bankrolled incumbent in a three-candidate, vote-splitting environment is exceptionably challenging. Maybe this is something Mr. Bloomberg considered in June of 2007, though at the time people ruminated instead about whether something was intended in terms of the presidential race. We ought to have discussed Mr. Riley’s opinion piece in our prior discussion of Bloomberg’s financial crisis leadership qualifications. His marshaling of numbers with respect to the city's debt would have been particularly valuable to add to what I wrote, but as we noted in our earlier piece, the calculated rush with which Mr. Bloomberg and Speaker Christine Quinn pushed the term limits extension through the City Council was not intended to leave time for considered reflection. “People that don’t change their mind when the facts change are so dogmatic, they’re not very practical or effective.” . . .
. . . . That is Michael R. Bloomberg’s statement made few days ago. Can the Mayor Change His mind When Facts Change? But what about Mr. Bloomberg? Is Mr. Bloomberg good at changing his mind when facts change? We are talking about the ill-advised Atlantic Yards megadevelopment. The facts have been changing a lot with respect to Atlantic Yards. But our “dogmatic” Mayor hasn’t wanted to change his mind and leave the mistake behind. Our economy changed; not the Mayor’s mind. . . . The megadevelopment’s schedule changed by decades: The Mayor seems to like parking lots which might conceivably be there until he is six feet under. . . . . The project’s cost is up (Beyond what the New York State PACB approved. ); by more than 50%. . .. . We’ve gone from a hypocritical Governor Spitzer to Governor Paterson, who has a history of opposing eminent domain abuse. . . . .The flimsy theory of the arena’s tax-exemption was blown.- But the Mayor is willing to embarrassingly have the city unconscionably lobby the IRS to grandfather loopholes and fake real estate tax appraisal figures to try to salvage it. .. Remember: There is no legal or binding obligation for the city or the Mayor to go through relentless gyrations to prop up the project against the public’s interest. What does it take to change the Mayor’s mind about an acknowledged mistake? Is there no line that the Mayor would not cross in pursuing such a mistake? Is the Mayor’s inflexible conduct in the face of change what the Mayor means when he talks about `dogmatism’ that makes a person “not very practical or effective”? Other Explanation at the Public’s Expense? Why would Mayor Bloomberg be committed to perpetually pursuing a mistake at the expense of the public? Want an explanation for the Mayor’s irrational and seemingly dogmatic commitment to a mistake? The more irrational and dogmatic the Mayor is in his commitment to the Atlantic Yards mistake, the more it seems that the only reasonable explanation is that the Mayor is adhering to a quid-pro-quo that puts developer/subsidy-collector Bruce Ratner above the public interest. And Then There Is Irrational Exuberance!!!! While we are at it, is there any substantial difference between: a.) irrationally and dogmatically adhering to a mistake when the facts change and b.) irrational exuberance without any regard to facts at all? I refer to the fact-divorced irrational exuberance the Brooklyn Borough President has for the Atlantic Yards project. Mr. Markowitz has something in common with Mr. Bloomberg. Similar to Mr. Bloomberg, Borough President Marty Markowitz’s “charities” have been taking hundreds of thousands of dollars from Atlantic Yards' Bruce Ratner. Irrational and inexplicable exuberance? Atlantic Yards Report asked the question: Is Mr. Markowitz bought and paid for? 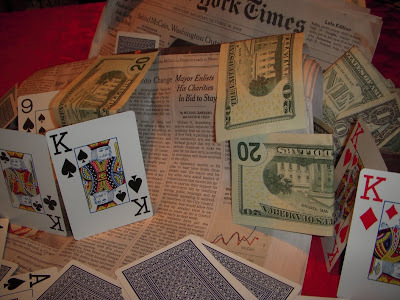 The question is examined very well: Monday, October 13, 2008, Marty "bought and paid for"? Following up on the Post's scoop. Bloomberg Qualified Financial Crisis Leader? He Can Learn Says Schumer! 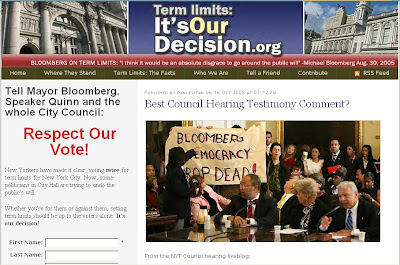 At last week’s abrupt and rushed City Council hearings on whether term limits should be modified in the name of “billionaire exceptionalism,” we testified about the Bloombergian claim that exceptions must be rushed through because Mr. Bloomberg is supposedly specially qualified to lead the city during the Wall Street Financial crisis. Mr. Bloomberg has told us that he is uniquely equipped to help the city during the current Wall Street financial crisis (only as mayor). We disagree. Warren Buffett, George Soros and Felix Rohatyn were among those who offered warning about the financial crisis before it started unfolding. We are not aware of Mr. Bloomberg offering any similarly prescient or unique warnings. If you want to lead in this crisis, we think it matters if you are able to see the problems coming. Especially if it is the area of your presumed expertise. In the longer written testimony we submitted, we observed that “despite his place atop the pinnacle of so much information” (as mayor of the financial capital New York and the owner of a media company whose business it is to specialize in the dissemination of financial information), Mr. Bloomberg was not able to see the crisis coming. We are not swept up in the rally-around-and-keep-our-current-leader-in-a-time-of-unfolding-crisis campaign. The premise was rejected when it was suggested that Giuliani be specially held over in office after 9/11. We similarly reject that the Bloomberg, who took office when Giuliani cleared the way, should be kept because of the Wall Street crisis. Giuliani, who did not foresee the likelihood of another attack on the World Trade Center, built his emergency command center in the Trade Center, where it was destroyed in the second attack. Bloomberg did not foresee the current foreseeable Wall Street crisis. As a Wall Street insider he is likely less fit, rather than more, to have perspective on the unfolding events. Maybe we would have more patience with Mr. Bloomberg if we, ourselves, had not clearly seen the crisis coming. We thought we needed to be fair to Mr. Bloomberg. Perhaps he’s had some foresight we didn’t know about. Noticing New York contacted both Bloomberg, LP and the Mayor’s Press Office and asked for a quote with an associated date wherein Mr. Bloomberg warned, in advance, about what was coming. You would think that any Bloomberg spokesperson would be eager to get such quotes out to the public. Especially since a vote was being rushed to the City Council, legislating billionaire-term-limits-exceptionalism into the City Charter predicated upon Bloomberg’s special claim of expertise. Notwithstanding the imminence of the vote, Noticing New York has not heard back from any Bloomberg spokesperson with any such quote. Doubtful that one exists. The whole claim that financial industry expertise is the reason Bloomberg thinks he should stay is bogus anyway. We previously quoted Clyde Haberman on this subject. In fact, he was thinking and winking about a third term well before the Dow Jones charts started looking like the EKG of a heart attack victim. Bloomberg as Crisis-insider Lacking Perspective? We have seen a lack of Bloombergian perspective on Wall Street from an urban planning perspective. Back in December 2007, in a letter of comment to the Metropolitan Transportation Authority we reviewed the competing proposed designs for the Hudson Yards project. In our comments we worried about the Bloomberg administration’s misguided priorities in selecting what should have been the best design for the very important, very big project that will define a newly-to-be-constructed area of West Side Manhattan: Built over rail yards (unlike Atlantic Yards, which is only 40% so), the Hudson Yards project will fill in a section of the urban fabric and street grid. We worried that because of mistaken presumptions about Wall Street, the Bloomberg administration would be attracted to one of the worst proposed designs, the Tishman Speyer proposal. Huge building floor plates, (something for which downtown Brooklyn has recently been rezoned) do not make for good urban design. We were worried that Bloomberg would sacrifice good urban design for phantom financial center growth. Our concern about Bloomberg misguidedness was well-founded (as were our concerns about projecting reliable Wall Street growth). We thought, as did the general public, that the Brookfield Properties proposal was clearly the best proposal for Hudson Yards and that the somewhat similar Related Companies proposal was the second best. Notwithstanding, the Tishman Speyer proposal was selected, very likely due to pressure from the Bloomberg administration and its attraction to large floor plates. Brookfeild dropped out of the bidding under somewhat suspicious circumstances to focus on another nearby project with which they would need help from the city. In the end, Tishman could not fulfill its bid obligations and the development rights were awarded to the Related Companies instead. Ms. Klein suggested (6:30 in the program) that the original Paulson rescue plans opposed by the public, (both the 3-page plan and the one that finally passed), were “primarily focused on buying debts and distressed assets, essentially moving the crisis from New York to Washington so the debts could detonate on the public books.” She said that he public’s initial visceral objections to the plan, despite a lot of condescension to their views, were “proven right.” She said the "economic profession has overwhelmingly said that this was a bad idea" and that the European model proposed by British Prime Minister Gordon Brown of a direct infusion of equity to encourage lending was better. She said that we were lucky in that because of the delay and negotiation occasioned by the public objection there was ultimately a small clause that allows the federal purchase of equity in the banks to infuse capital.
. . . a 12% return for UK taxpayers on their investment; he negotiated voting rights, seats on the board, and also, and this is key, he got, in writing, the fact that the banks had to use this money for what Paulson said the bailout is for, which is addressing the credit crunch. . . . Gordon Brown got that in writing and what is happening with the British banks is that they are having to begin lending again. What’s happening in the US? Let’s contrast this. 5% returns, no seats on the board, no voting rights and it turns out that they are just hoping that they spend the first phase of $125 Billion . . . .lending. But now the banks are saying what they plan to spend it on. Citi is saying they are going to spend it on merger, Morgan Stanley is spending a chunk of it on bonuses because they are paying out $10 billion on employee salaries this year, including bonuses. They only made $5 billion so that some of the money is going there. And that is another difference in Britain; Brown negotiated that they can’t be paying shareholders while they are receiving this equity. The taxpayers are the shareholders. That is basically the same idea we have with respect to Mr. Bloomberg. As noted under the previous heading on the subject of urban planning concerns, Mr. Bloomberg was overly inclined to accommodate Wall Street before there was financial crisis. Dealing with a real crisis, his bias and lack of perspective is likely to be more destructive. We found an interesting article in the New York Observer of which we are suspicious in a number of ways. 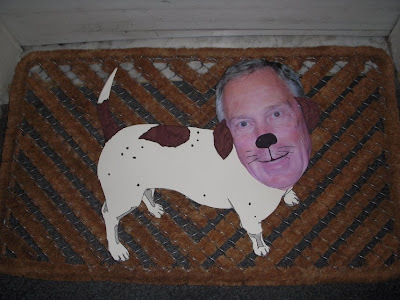 The article is Mayor Bloomberg: Suddenly Seer of Financial Crisis How Did Mike Get Cast As Mr. Market Wisdom? ‘As I Said to Obama’, by Jason Horowitz, September 23, 2008. Contrary to what might be inferred from the article’s title, the piece does not say anywhere that the Bloomberg “foresaw” anything. “Seer” apparently means that he is “financial expert” enough to understand or be “wise” about what he sees after it has already happened. But for now, as a practical matter, it’s not really important whether expectations about Mr. Bloomberg’s ability to heal the financial world are realistic. Given the mayor’s current circumstances—term-limited mayor seeks options for prolonging time in current office or obtaining national one—it’s all upside. And the mayor, quite naturally, has taken to his role enthusiastically. Given that an assault on the City Charter to overturn the limits applicable to the Mayor did not seem to be in the offing at the time, perhaps the reporter can be forgiven for the puffy and uncritical way he refers to Bloomberg’s enthusiasm about becoming a healer of the financial world. Another disjuncture is the article’s discussion of the possibility that Bloomberg would go to Washington D.D. to take a federal job. Wouldn’t that be something; we “temporarily” overturn term limits because fellow Billionaire Ronald Lauder wants to see Bloomberg specially privileged with a third term and then Bloomberg lights out on the city to take a job in Washington? Mr. Bloomberg got his name in the press by calling Senator Obama and John McCain to offer financial advice. "I said to Senator Obama last night, there are a number of different levels he has got to address, and Senator McCain the same thing,"
“A number of different levels?” Great, they could have gotten the same advice from Sarah Palin.
. . . .where he talked about root causes of the crisis and deflected Tom Brokaw's queries about whether he was interested in a job managing the bailout in Washington. 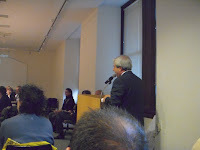 I think in his time as mayor also has an allegiance and a loyalty to the common man," said Mr. Friedman. "His loyalties aren't just with Wall Street now. He wouldn't be snookered." We don’t think that is the case. We love Friedman but Friedman, as with the Bush administration in the initial stages gearing up for the Iraq war, doesn’t always get it right. This looks like another time he got snookered. We do think Bloomberg’s loyalties are with Wall Street. The urban planning in Bloomberg’s administration has been pure urban-planning-by-investment-banker. It always makes the “deal” more important than what’s “ideal.” I am not sure we don’t have to worry that Bloomberg won’t get snookered and we probably have to worry that, as with Atlantic Yards, he will help do the snookering. Maybe that is the point here. Mr. Bloomberg himself has enough things to learn. When it comes to who should be Mayor, who is to say that there aren’t qualified individuals apart from Mr. Bloomberg who can learn what they need to so that the City of New York doesn’t need to reorganize its government to crown him with a third term. Bloomberg had his chance to get to know Wall Street intimately and be suspicious of it. He failed to spot its problems. Why not give somebody else a chance? We should recognize Bloomberg for what the article says he is financially; he is “Mr. Bloomberg, who made his fortune by inventing and marketing the Bloomberg Terminal.” That is what he is, no matter how many Treasury Secretaries the article says he can name. He added, unprompted, that a few hours earlier he had greeted President George Bush at the airport and talked with him very briefly about the economy. Mr. Bloomberg is a politician. This Observer article that appears to have been generated with a politician’s agenda is not, when you truly consider it, about whether he has special qualifications to lead in a financial crisis. The picture appearing at the start of this piece is from today’s front page New York Times story about today’s term limits vote. 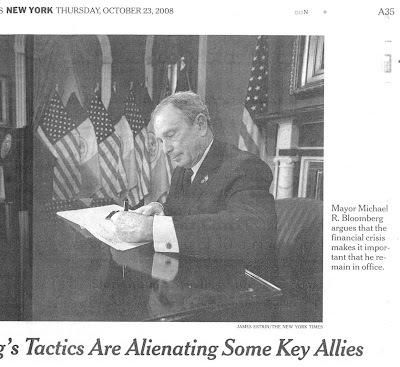 The caption of the picture “Mayor Michael R. Bloomberg argues that the financial crisis makes it important that he remain in office.” Though that is the caption, the New York Times has not yet done a new story analyzing Mr. Bloomberg’s suitability and qualifications to manage the city during these financial difficulties. This is so notwithstanding that the fact that the Times has now run two editorials urging the repeal of term limits to clear the way for a Bloomberg third term. 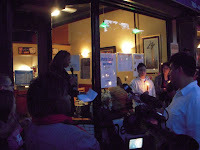 The first editorial (Editorial: The Limits of Term Limits, September 10, 2008), said that the Mayor needed to stay in office to lead the city “in these difficult financial times.” The second ran today in order to influence and give cover for the City Council vote (Editorial Term Limits and the Council). Usually the editorial page of the Times runs editorials one to two days after publication of the news stories covering the subject matter, usually two. In this way the opinions offered by the editorial page can be a sober reflection on the facts. This then is an instance where the Times has gone out on a limb to reverse process by running not one, but two, editorials preceding articles with factual reportage. In fact, I am unaware of any pieces by any news organizations which like this one analyze the Mayor’s main argument to remain in office; that he has special acumen qualifying him to manage during the Wall Street financial meltdown. In today’s Times article (Mayor’s Tactics Are Alienating Some Big Allies, by Michael Barbaro)Mr. Bloomberg dismissed people such as ourselves who testified in opposition to his move at the City Council hearing as “people who emote.” Notwithstanding Mr. Bloomberg’s dismissal, we hope that our Noticing New York reflections here contribute valuably to an appropriate consideration of the importance or probable non-importance of specially privileging Bloomberg to remain in office. There is, indeed, a lot to think about. We have already written other pieces on the subject, but obviously this one is too late. We and others have not been given time to provide reflections, nor has the public had time to think these things through. This was by design: Bloomberg and Speaker Christine Quinn deprived all us of time for thoughtful consideration. They rushed the process, knowing well in advance what they intended to do. Are the Atlantic Yards Land Grab and City Official Fraud Being Used to Finance Bloomberg’s Bid for Billionaire Term Limit Exceptionalism? Here is a quick thought we can’t seem to shake. It’s been bedeviling us ever since we posted our article about the way in which abuse of “charities” for political ends has gotten out of hand: Monday, October 20, 2008, “Charity?” We Begin to Groan. Is the Atlantic Yards land grab paying for Mayor Bloomberg’s effort to specially exempt himself from term limits and achieve a third term? For that matter, is the Mayor’s bid for billionaire exceptionalism fueled by city officials' fraud? It seems pretty simple. In an apparent quid-pro-quo for city approvals for Atlantic Yards, developer/subsidy-collector Forest City Ratner gives hundreds of thousands of dollars to the Mayor’s charities; the Mayor then uses his charities as an instrument of pressure to generate coerced testimony in favor of his remaining in office. Similarly, we reported on how Forest City Ratner money was flowing back to the Bloomberg-championed-and-sponsored “New York City Waterfalls” project in “Charity?” We Begin to Groan and Self-Congratulation “Befalls” a Man Who Would Know No Limits (Wednesday, October 15, 2008). Last Thursday the president of the Bloomberg-benefactored Public Art Fund, which did the Bloomberg-championed Waterfalls (with a complex array of Bloomberg-directed funds coming into it), testified in favor of amending the City Charter for an exception to keep Bloomberg in office. This was reported in the New York Times front-page story about how charities were pressured to provide this kind of supportive testimony at the Thursday City Council hearings. The pressured charities were receiving “donations” from Bloomberg as a “private” corporate-donor and/or from city donations he controls as Mayor (See: Bloomberg Enlists His Charities in Bid to Stay, by Michael Barbaro and David W. Chen). How much money is flowing in total? If we think that it is limited to what was picked up on in the Schuerman Observer article in our Noticing New York posts, we are probably naive. Also, although the Schuerman article cites a $450,000 and $1 million range for the “donation” made at the time of the December 2005 Atlantic Yards activities, neither the Observer article nor our own can cite with specificity the exact amount of money, due to the secrecy that surrounds this kind of activity. We know we are talking about at least hundreds of thousand of dollars, perhaps much more. That essentially closes the loop. The Atlantic Yards land grab is funding the Mayor’s bid to stay in office to the tune of hundreds of millions of dollars or more. You can add to the picture fuel from city official fraud to serve Ratner’s Atlantic Yard’s interests. We will get to that in a moment. Is the involvement of charities sufficient to launder these funds so that they are not considered kickbacks and improper? We’ll see what the NYC Conflicts of Interest Board has to say, but our own opinions will survive for obvious reasons. That Atlantic Yards is financially supporting the Mayor’s bid to stay in office comes back full circle because the Mayor remaining in office is likely to interfere with the natural and deserved political death the megadevelopment deserves. Mr. Bloomberg has redefined the concept of principle. These days, he calls it dogmatism. “People that don’t change their mind when the facts change are so dogmatic, they’re not very practical or effective,” he said a few days ago. What has changed, he says, is the turmoil in the American economy; it requires that his hand remain on the tiller an extra four years. In fact, he was thinking and winking about a third term well before the Dow Jones charts started looking like the EKG of a heart attack victim. For the mayor, principle had morphed into dogmatism quite a while ago. Are there limits? If Bloomberg is using everything available to him, including the flow-back of Atlantic Yards land grab money to stay in power, then we think his efforts are also being fueled by city officials’ fraud. We note with a fair amount of consternation the just-reported action by the IRS to provide Forest City Ratner with a special loophole to possibly issue tax-exempt bonds for the proposed Atlantic Yards Nets basketball arena. (See the many recent press reports.) This would not have been possible without highly inappropriate lobbying by city officials. Furthermore, if these bonds are ever allowed to be issued, it will be tantamount to a direct reward of benefit to Forest City Ratner for fraud perpetrated on the IRS by city officials who collaborated in ginning up fake numbers to try and fool the Feds. (See: Wednesday, October 1, 2008, Safety in the Numbers You Pull out of a Hat.) I have not had time to study the theoretical shelter for Ratner that is provided by the recent IRS action. I am not sure it will actually work to make the bonds tax-exempt in light of the city’s misrepresentations. I suspect the tax-exemption of the bonds will be subject to challenge. The point is that when principle and a government of rules is replaced by a government of men then anything is possible, fraud and kickbacks included, and all that really matters is what serves the interest of “billionaire exceptionalism.” What would best serve the people is left by the wayside. Alright, this can’t wait any longer although it has already been reported by others. 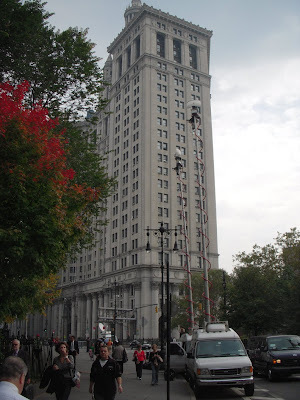 We usually self-report our Noticing New York testimony in a post after hearings. 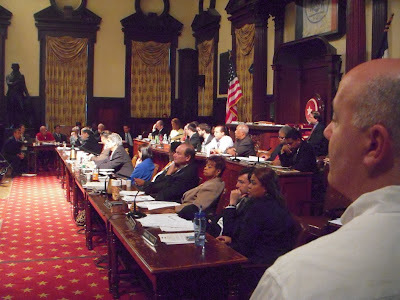 Last Thursday, we testified at the City Council hearing on Bloomberg’s proposed repeal of term limits to specially give himself a third term. We arrived home late from the hearing and phoned a Coney Island colleague, who told us that they were laughing because our testimony of a half hour before had already been reported upon by the New York Times live blog of the hearing. The next morning it also appeared in a thorough account of the day’s hearing in Atlantic Yards Report. Michael D. D. White, a lawyer who blogs at The Huffington Post, was the next up. Referring to the two-minute limit on testimony, he said, “I’d like to have my limits extended to five minutes, please.” When Mr. Felder politely declined, Mr. White said, “You don’t like the rules being changed in the middle of the game.” That retort prompted applause from several of the remaining audience members — there are a few dozen now, down from hundreds earlier. So now, perhaps it is time to self-report and tell you about the rest of Noticing New York’s testimony on Thursday. First, some background. Though we were exhilarated by the importance of testifying, the day was grueling. We arrived at 11:00 AM and were turned away by City Hall security because we were too early. (Former City Councilman and Parks Commissioner Henry Stern, a more familiar figure, recounting about his own testimony in opposition to the Bloomberg maneuvering, says he got in at 11:00 AM.) When we returned at 2:45 we were told by security that we couldn’t come in because we were too late; we would have to wait. Then, looking at our jacket and tie, the security guard paused, “Wait,” he said, “are you going to testify?” “Absolutely,” I told him and he told me that they could let me in if I was on the list of people who were supposed to be let in to testify. Though I made him check the list I was, of course, not on it. The sign holders resisted efforts to find out who they were and why they had gone to City Hall. Everything about them screamed rent-a-crowd. In addition to the sign holders, there were the well-dressed beneficiaries of the Mayor’s “charities.” The Times has already written, about how they were pressured to be there writing, not once, but twice. We did so ourselves, not only afterwards, but maybe by not-such-a-coincidence we wrote beforehand about the Mayor and the Public Art Fund. When we were at the hearing Susan Freedman, (inset) president of the Public Art Fund, testified for her benefactor, the Mayor. She did not mention the extent to which he had `benefactored’ her. He did so substantially. You can read what we wrote. 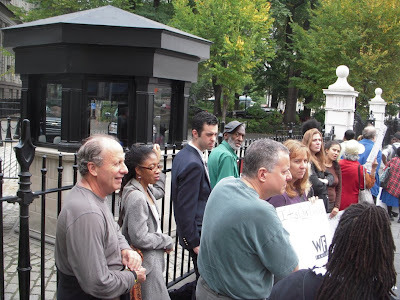 We outnumbered the Mayor’s remunerated minions but because of them, real people had to wait to get in and testify. Were the minions on “the list” to get in? The Post described how lunch money was being doled out to them. Our waiting outside to get in was not a total loss. We got to talk to a reporter from Reuters. We finally got in and signed up to speak at 3:38. On our way in we saw the Mayor exiting with a stressed-looking Amanda Burden, the Chairman of the City Planning Commission which deals a lot with real estate developers. We wondered what that was about in an earlier piece, given that the hearing on term limits was the order of the day. We did not get to testify until after 10:00 PM. Reducing meaningful testimony down to two minutes is almost impossible. It is hard enough to reduce testimony to three. I didn’t know if my jest about asking that my “limits be extended” to five minutes would work, but I began by referring to the fact that allowing for three minutes is more typical. Noticing New York believes term limits' greatest value is with respect to certain city offices. First and foremost the office of the Mayor.- Parallel to our federal system. While we tend to disfavor term limits, we are absolutely against their elimination in the middle of the ongoing 2009 election cycle. Most objectionable is the Bloomberg/Lauder billionaires' pact designed to make the repeal of term limits a special event for wealthy Mr. Bloomberg. We have been communicating with our representatives and those running for office, predicated on the understanding that term limits were the rules of the game. Meanwhile, Mayor Bloomberg was communicating privately to members of his real estate developer constituency that he was NOT planning to have these publicly understood rules apply to him. Not Fair! Not fair to any of us. Campaign finance questions highlight just one way in which changing the rules in the middle of the game is unfair and problematic. The rules, including those of campaign finance, are already too special for Mr. Bloomberg. This specific change would probably not have been ventured were his wealth not an operative factor. Warren Buffett, George Soros and Felix Rohatyn were among those who offered warning about the financial crisis before it started unfolding. We are not aware of Mr. Bloomberg offering of any similarly prescient or unique warnings. How can $15 million in public spending for a referendum setting election rules for everyone be considered too extravagant if Mr. Bloomberg himself plans to privately spend $80 million of his own money to campaign for his third term? The Mayor’s heavy personal giving to the city’s cultural institutions is a problem. People have pointed out that “giving” immunizes the Mayor from criticism from New York’s most influential citizens. Silence may have been more pronounced because everyone mistakenly expected him soon to be out of office because of term limits. 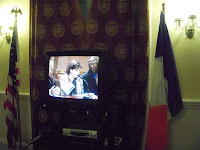 It is not fair that Speaker Quinn is using City Council Chairmanships designations to manipulate Council member voting. This belies the story that days ago she herself was undecidedly treating this as a difficult issue on which to make a choice. At least I, the Times, and others have now had a chance to begin to write about the problem the Mayor’s heavy personal (and sometimes municipal) giving to the city’s cultural institutions is a problem. I was able to hand in the longer written testimony which concludes this piece. Meanwhile, get involved. For instance, check out the “Term Limits: “It’s Our Decision.org” site. Certain City Council Members need to be called and told to do the right thing. We are sorry to say that David Yassky, whom we like to support, is among those who still needs a push. Call him at (718) 875-5200. 1.) Noticing New York mostly disfavors term limits while recognizing that they can have certain values. The value of term limits is likely greater with respect to certain city offices. The office which most probably should be subject to term limits is that of the Mayor. And if the executive office of the Mayor were singled out as the sole office to which term limits would apply, the City Charter would then reflect an approach parallel to that of the U.S. Constitution and our national elective offices. 2.) While we tend to disfavor term limits, we are absolutely against their elimination in the middle of the ongoing 2009 election cycle. 3.) The proposed elimination is made profoundly more objectionable by the Bloomberg/Lauder billionaires’ pact designed to make the repeal of term limits a special event applicable only to the exceedingly wealthy Michael R. Bloomberg. 4.) Noticing New York has been very attentive to the current campaigns for elective office and has based its strategies in communicating with current elected officials and those running for office, taking into careful account term limits as the publicly understood rules of the game. We are not the only ones who have so weighed our actions. At the same time Mayor Bloomberg was communicating privately with members of his real estate developer constituency that he was planning to have these publicly understood and appreciated rules not apply to him. This is not fair to any of the citizens of New York. 5.) The problematic questions that will arise with respect to campaign finance highlight how unfairly problematic it is to change rules in the middle of a game in but only one respect. 6.) The rules, including those of campaign finance, are already special for Mr. Bloomberg and tilted in his favor. His proposal for a special application of term limits to himself probably would not be possible were his wealth not an operative factor. As Atlantic Yards Report noted today, how can $15 million publicly spent on a referendum setting election rules for everyone be considered too extravagant if Mr. Bloomberg himself plans to privately spend $80 million of his own money to campaign for his third term? 7.) Because Bloomberg, LP giving is clearly an extension of Mayor Michael Bloomberg’s influence, the Mayor’s heavy personal giving to so many of the city’s cultural institutions has been viewed as a problem. People have pointed out that giving quietly immunizes the Mayor from criticism. Institutions receiving the money are less like to criticize the Mayor, and each institution has associated with it huge numbers of New York’s most influential (and wealthy) citizens whose impulses to criticize the Mayor are probably also largely neutralized. The silence may have been more pronounced because people and organizations expected him soon to be out of office because of term limits. 8.) It is not fair that Speaker Quinn is using the award and withholding of City Council Chairmanships to manipulate Council member voting on this issue. This belies as disingenuous the story that Speaker Quinn told the press, saying that until days ago she herself was undecidedly treating this as a difficult issue on which to make a choice. 9.) Mr. Bloomberg has told all of us that he is uniquely equipped to help the city during the current Wall Street crisis and that the assistance he can offer requires he be granted a third term as Mayor. We disagree. We think that as time affords us perspective we will discover that being a crisis-insider actually handicaps Mr. Bloomberg’s ability to offer effective aid. 10.) Warren Buffett, George Soros and Felix Felix G. Rohatyn were among those who offered warning about the financial crisis before it started unfolding. Despite his place atop the pinnacle of so much information, we are not aware of Mr. Bloomberg’s offering of any similarly prescient or unique words. 11.) I would like to conclude my statement by saying that when I came to testify my time to speak was going to be limited to 3 minutes but I myself am now changing that rule to allow myself 5 minutes- But that might be unfair because. . ..